A depressive phase is followed by hibernation for recuperation purposes and then the emission of a “narcissistic signal”: a call for new narcissistic supply. I know a narcissist intimately. Sometimes he is hyperactive, full of ideas, optimism, plans. At other times, he is hypoactive, almost zombie-like. You are witnessing the narcissistic signal-stimulus-hibernation mini-cycle. Narcissists go through euphoric and dysphoric cycles. These are long cycles. They are dilated, all encompassing, all consuming and all-pervasive. They are different from manic-depressive cycles (in the Bipolar Disorder) in that they are reactive, caused by easily identifiable external events or circumstances. For instance: the narcissist reacts with dysphoria and anhedonia when he loses his Pathological Narcissistic Space, or in a major life crises (financial problems, divorce, imprisonment, loss of social status and peer appreciation, death in the family, crippling illness, etc.). But the narcissist also goes through much shorter and much weaker cycles. He experiences brief periods of mania. Then he can be entertaining, charming, and charismatic. Then he is "full of ideas and plans", attractive and leader-like. In the manic phase, he is restless (often insomniac), full of pent up energy, explosive, dramatic, creative, an excellent performer and manager. Suddenly, and often for no apparent reason, he becomes subdued, depressed, devoid of energy, pessimistic, and "zombie-like". He oversleeps, his eating patterns change, he is slow and pays no attention to his external appearance or to the impression that he leaves on others. The contrast is very sharp and striking. While in the manic phase, the narcissist is talkative and gregarious. In the depressive phase he is passively-aggressively silent and schizoid. He vacillates between being imaginative and being dull, being social and being antisocial, being obsessed with time management and achievement and lying in bed for hours, being a leader and being led. These mini-cycles, though outwardly manic-depressive (or cyclothymic) - are not. They are the result of subtle fluctuations in the volatile flow of Narcissistic Supply. The narcissist is addicted to Narcissistic Supply: admiration, adoration, approval, attention and so on. All his activities, thoughts, plans, aspirations, inspiration, and daydreams – in short, all the aspects of his life – are dedicated to regulating the flow of such supply and to rendering it relatively stable and predictable. The narcissist even resorts to Secondary Narcissistic Supply Sources (a spouse, his colleagues, or his business – SNSS) in order to "accumulate" a reserve of past Narcissistic Supply for times of short supply. The SNSS do this by witnessing the narcissist's accomplishments and moments of grandeur and recounting what they saw when he is down and low. Thus, the SNSS smooth and regulate the vicissitudes of the supply emanating from the Primary Narcissistic Supply Sources (PNSS). But the very process of obtaining and securing Narcissistic Supply, in the first place, is complex and multi-phased. First there is a depressive phase. To obtain Narcissistic Supply, the narcissist has to toil. He has to work hard to create Sources of Supply (PNSS, SNSS) and to maintain them. These are demanding tasks. They are often very tiring. Exhaustion plays a major role in the mini-cycles. His energy depleted, his creativity at its end, his resources stretched to the maximum, the narcissist reposes, "plays dead", withdraws from life. This is the phase of "narcissistic hibernation". The narcissist invariably goes into narcissistic hibernation before the emission of a narcissistic signal (see below). He does so in order to gather the energies that he knows are going to be needed in the later phases. During his hibernation, he surveys the terrain, in an effort to determine the richest and most rewarding sources, veins and venues of Narcissistic Supply. He contemplates the possible structures of various signals, in order to ensure that the most effective one is emitted. Building up his energy reserves during the hibernation phase is crucial. The narcissist knows that even the manic phase of the mini-cycle, following the receipt of the narcissistic stimulus (see below) is taxing and laborious. Having thus reposed, the narcissist is ready to go. He jumps start the cycle by emitting a "narcissistic signal". It is a message – written, verbal, or behavioural – intended to foster the generation of Narcissistic Supply. The narcissist may send letters to magazines, offering to write for them (for free, if need be). He may dress, behave, or make statements intended to elicit admiration or opprobrium (in short, attention). He may consistently and continuously describe himself in glamorous and flattering terms (or, conversely, fish for compliments by berating himself and his achievements). Anything goes in order to become well known and to impress people. Narcissistic signals are automatically triggered and emitted whenever an important element changes in a narcissist's life: his workplace, his domicile, his position, or his spouse. They are intended to re-establish the equilibrium between the uncertainty which inevitably follows such changes and the narcissist's inner turmoil which is the result of the disruption of the patterns and flows of Narcissistic Supply caused by said changes. Ideally, the narcissistic signal elicits a "narcissistic stimulus". This is a positive sign or response from the recipients of the signal indicating their willingness to swallow the narcissist's bait and to provide him with Narcissistic Supply. Such a stimulus brings the narcissist back to life. It energises him. Once more, he becomes a fountain of ideas, plans, schedules, visions and dreams. 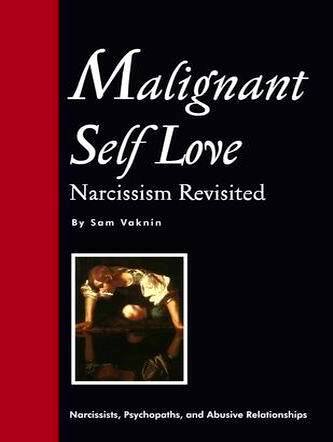 The narcissistic stimulus pushes the narcissist into the manic phase of the mini-cycle. Thus, caught between mini-cycles of mania and depression and bigger cycles of euphoria and dysphoria – the narcissist leads his tumultuous life. It is no wonder that he gradually evolves into a paranoid. It is easy to feel persecuted and at the mercy of forces mysterious, capricious and powerful when this, indeed, is the case.